Our Springs Apartments team loves our four-legged residents! We know that physical activity is just as important for them as it is for their humans. Exercise outings are also a great way for you to spend quality time with your precious pet. We've put together a list of suggestions for activities that are fun for both of you. Think of agility training as a doggy obstacle course where your pet slaloms around posts, jumps hurdles and balances on boards. 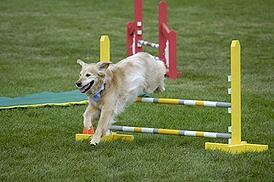 It's a wonderful energy- and calorie-burner, and your dog will develop confidence in his skills. Many parks have been adding agility courses to leash-free areas, and you can often find them at doggy day care facilities. This classic game is suitable for a variety of locations and conditions. You don't need a special venue, and the only equipment required is a stick, toy or any object your pet will chase down. On rainy days you can even play fetch from the comfort of the sofa in your Springs Apartments home. Have you ever observed the joy of two dogs playing together? In addition to releasing energy, doggie play enables your pet to develop his social skills. Make a trip to off-leash park or schedule a date to meet up with a friend and her dog so you have some company too. If your pet has a tendency toward aggressive behavior, consult your vet for socialization tips before pairing him up with other dogs. Walking with your dog has the appeal of different locations and scenery. Mix it up with options like jogging/running intervals or walking your pet over fallen leaves, puddles and other varied surfaces. Be careful to avoid surfaces with sharp rocks or other items that may injure your dog's feet and pads. Why not sit back and let your dog take charge for a change? Switch roles and allow him to take the lead while you follow along. It's a nice change of pace for your pet and you'll have fun seeing the directions he chooses to go. Find a staircase and simply go up and down it with your dog as many times as you can. Add variety with some high steps and side steps. Many dogs enjoy romping in the water, and swimming burns calories with less stress on the joints. Find a good-sized branch or stick and combine fetch with the water play. Always make sure the area is safe before allowing your dog to enter the water. If your pet is truly resistant or fearful, don't force him. Our Springs Apartments leash-free pet areas are perfect locations for many of these activities. As an added benefit, you and your precious pup can socialize with your neighbors. Do you have a favorite activity to add to the list? Let us know in the comments!